And while the ever increasing tourists are welcomed, can they be accommodated? Belize's airport has been steadily expanding to accommodate increased visitor, but this amateur video which we saw today shows us that something's still very wrong! 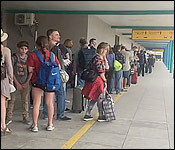 The video shows visitors lined up for hundreds of feet outside the arrival hall. No word on how long it took them to get processed - and we could not get a comment from the Director of Immigration. It's troubling because this footage was taken today, Friday, and there are significantly more flights arriving and departing on Saturday.